Have your students completed at least one meaningful assignment? Because Performance Insights provides summary statistics, it is recommended that you wait until your students have completed a couple of graded assignments before enabling. Performance Insights is a suite of data-based decision-making tools designed to support faculty in monitoring and ensuring students’ successful course performance. It can be enabled within an online course section. How do I use Performance Insights? Enable Performance Insights in your Webcourses@UCF online course section. 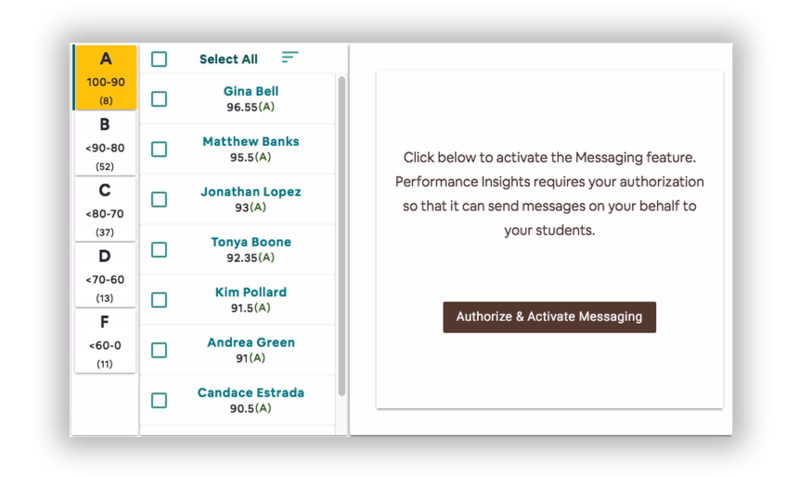 Use the Course Grade Messaging Insight to send targeted messages to students. Get technical help from Webcourses@UCF Support or your Instructional Designer. Why should I use Performance Insights? Do you have a grading scheme enabled? Ensure you have a grading scheme enabled before using this tool. You can learn how to enable or change a grading scheme by watching this Gradebook resource video. Navigate to the course where you would like to enable Performance Insights. Click Performance Inights from the Course Navigation Menu. Click Ready To Get Started within the Performance Insights integration window. Click Authorize & Activate Messaging. Click Authorize within the pop-up window. Navigate to the course where you would like to use Performance Insights. Select a letter grade to pull up a list of students with that grade. Select individual students or select all students. Write a message to students with an A or B or edit the sample message to students with a C or lower. When assignments are muted in the Gradebook, they will not be reflected in the scores displayed in this tool. Learn how to mute and unmute columns in the Gradebook by watching this Gradebook resource video. What is the "Course Grade Messaging" Insight? How do I use grading schemes in a course? How do I enable a grading scheme for a course? What do the numbers in the Grade Level box mean? The top set of numbers indicates the range of points assigned to the letter grade. The bottom set of numbers indicates the number of students whose grade is within the range above. What can I do with the list of students by Grade Level? Click "Select All" to message all students in the selected grade level. Select the one or few students you want to message. How does the messaging feature work? 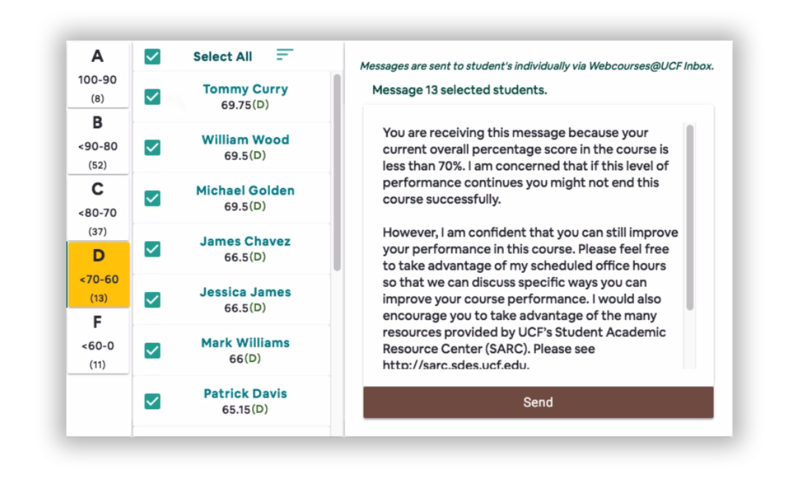 The course grade level insight uses the Webcourses@UCF Inbox (Conversations) feature. All messages are private to each student (equivalent to how blind carbon copy (BCC) works). Can I create my own message or edit the template message? Yes, certain grade levels have a templated message for your convenience; however, you can customize the provided message or create your own message as well. For assistance, please contact Webcourses@UCF Support.